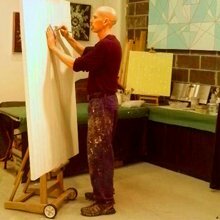 Bronxite Roy Secord is a NYC-based artist whose primary mediums include large-scale, contemporary abstract paintings on canvas, smaller paintings on paper, collages, assemblages, and carved, cast-stone sculptures. He is a social reformer through the transformative vehicle of the arts and the founder/president of Project YEAH (Young Empowered Artists 4 Humanity) which serves community at-risk youth and youth offenders. Roy Secord is also an arts educator, an instructor, and a master artist/facilitator for public artworks projects.